I have been unable to find out much about the regular army Marines. There seem to have been 3 battalions and they were trained to fight on land as normal infantry, not on ships. The Cairns/Perry book shows the marines in line infantry dress, with red facings and shoulderboards and sky-blue shako trimmings. 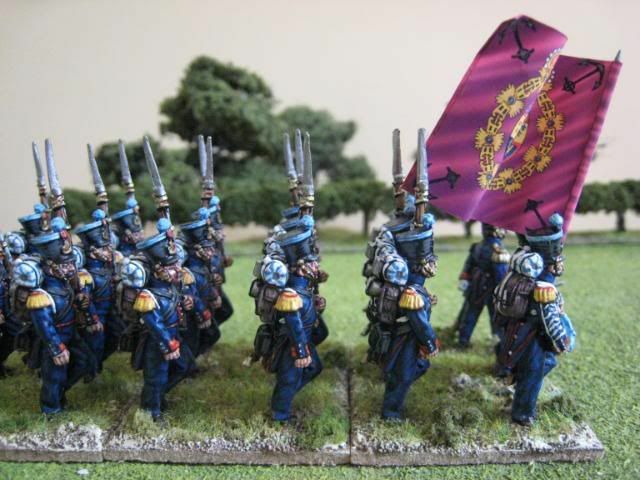 I wanted to add a single battalion of marines to my Isabelino army as I was attracted by the sky-blue pompoms on the shakos and also by the lovely purple flag. 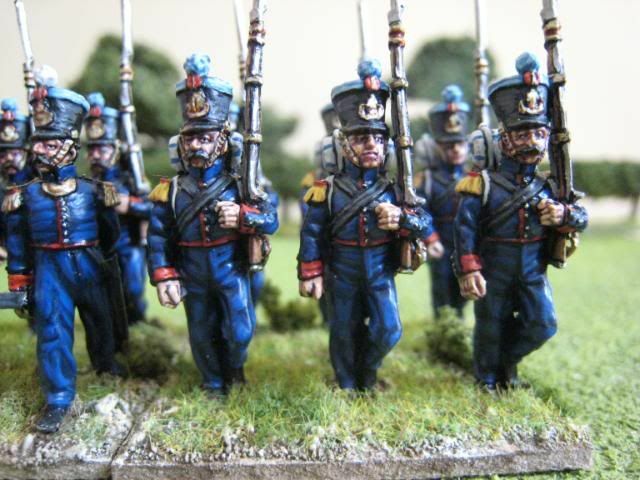 A battalion of marines was present at the battle of Oriamendi in March 1837, which is the orbat I am generally working towards. At that battle the strength of the marines seems to have been about 500, so a bit smaller than other regular battalions. Therefore, this unit has 18 figures rather than my usual 20. 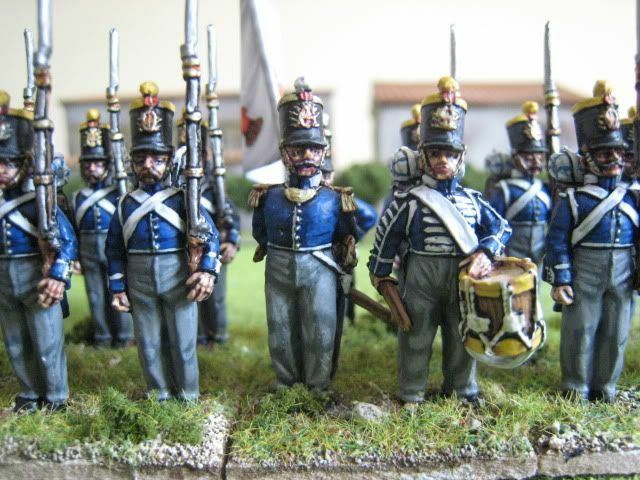 The figures wear the standard early war infantry uniform. I posted a query on the FCW Yahoo group about the marines' uniforms and received some interesting replies. A chap called Antonio said: "The Real Order of 12 February 1833 specify the following uniform of the marine infantry: turqui coat with nine gold buttons; turqui collar with gold lace in each side; turqui turnbacks with three gold laces; yellow epaulettes with red fringes; red cuffs and turqui cuff-flaps; turqui trousers for summer and winter and black short boots. " This fitted perfectly with the look I wanted - troops that looked like marines (i.e. 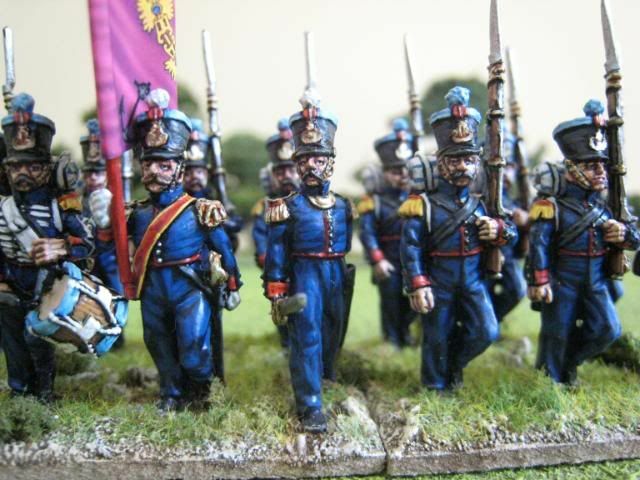 all in dark blue) rather than line infantry with a sky-blue pompom. With this in mind, I used a darker blue than usual for the coatees and trousers. There is some justification for that as the colour of turqui probably varied throughout the war. 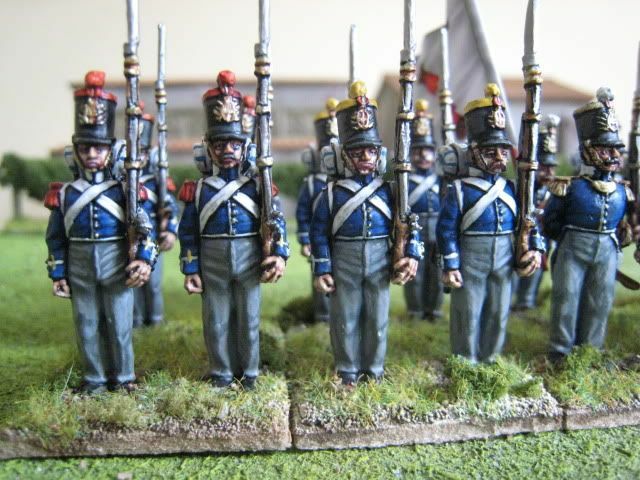 In order to ensure all the figures had two epaulettes, I had to sculpt ones on to the drummer and one of the officers; it seemed odd to have command figures without them if all the rank and file did. 18 figures. Pained May/June 2009. Flag by Adolfo Ramos. 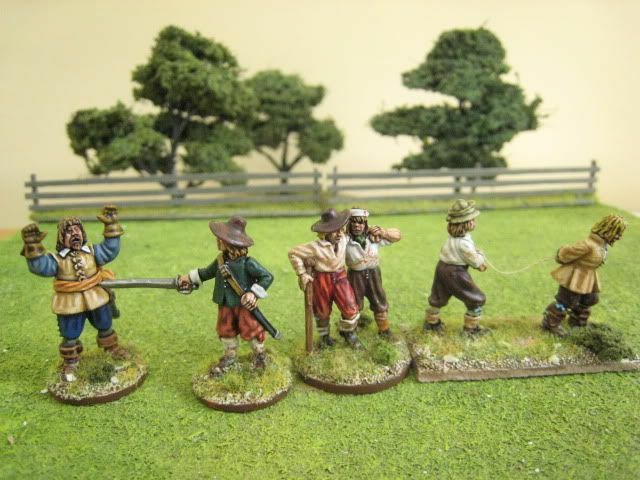 I've jumped ahead of the queue a bit to post some pics of my second ECW foot regiment, the Earl of Northampton's regiment (Royalist). There were two regiments that bore Northampton's name, one of foot and one of horse. At the start of the war, the Earl of Northampton was Spencer Compton, the second ascendant to the earldom. The foot regiment was raised in Oxfordshire partly by the second son of the Earl, William Compton. After the battle of Edgehill on 27th October 1642, the regiment was garrisoned in Banbury Castle. The castle was besieged by Parliament from July to 25 October 1644, at which point the siege was raised by William's older brother James, by that time the new Earl of Northampton. The 20-year old William received a knightood for his defence of Banbury Castle. 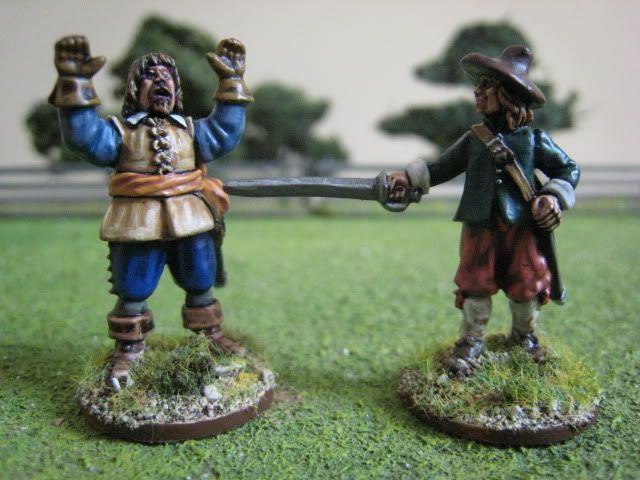 The regiment eventually surrendered itself to Parliament in May 1646 after a second siege of Banbury. William was apparently one of the founder members of the original Sealed Knot, a covert organisation founded in 1652 with the aim of restoring the Stuart monarchy. 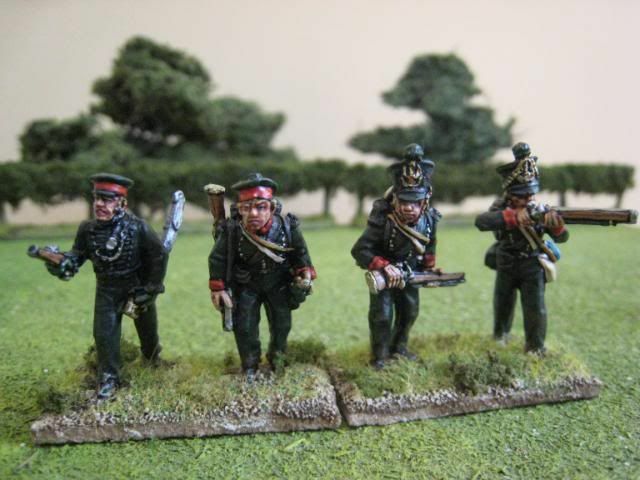 I chose this regiment for the simple reason that I liked the combination of green coats and red trousers. This uniform was taken from the Sealed Knot's recreated regiment, and I have no idea how accurate it is. 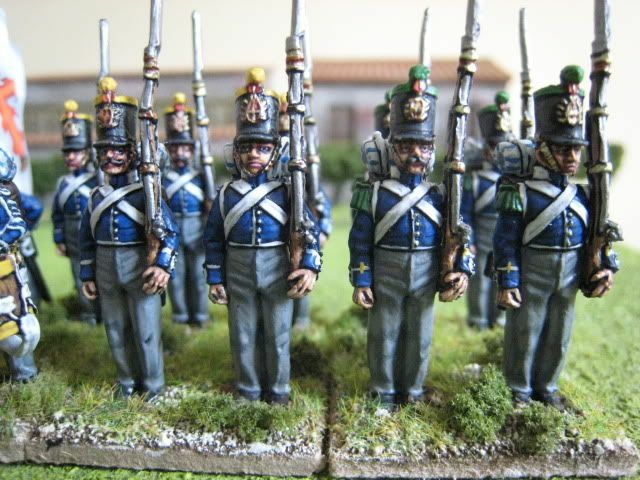 I decided at the outset of this project that I was not going to worry unduly about accuracy - I just want a collection of regiments that look pretty and have a modicum of connection to real historical units. 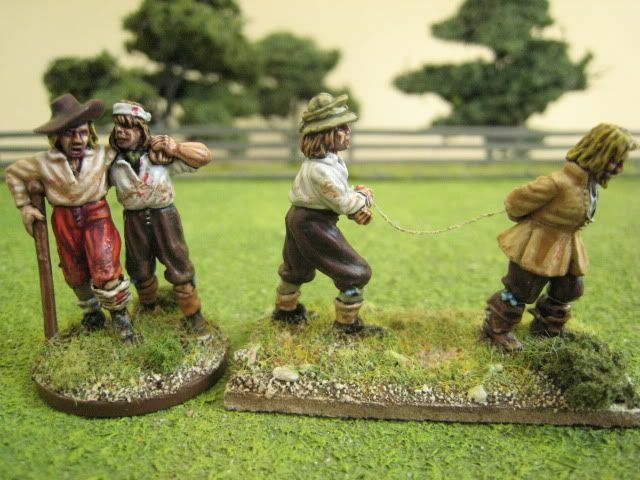 I mixed up the colours of the trousers a bit, but the coats were painted in just two combinations of dark green, so the look is fairly uniform. 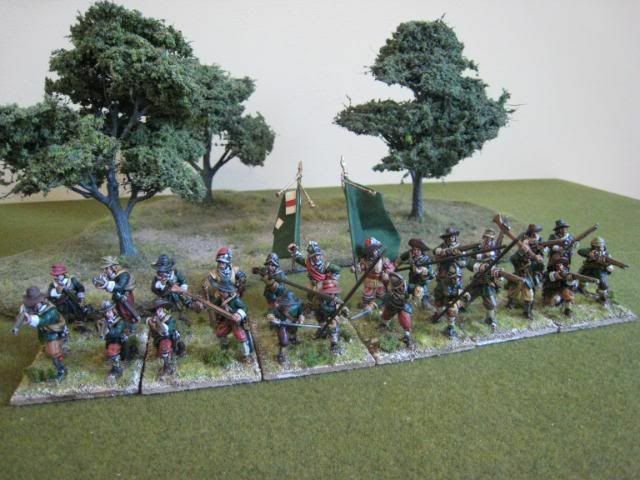 The flags are generic ones from GMB which are closest to those shown on the relevant page of the Sealed Knot's site. 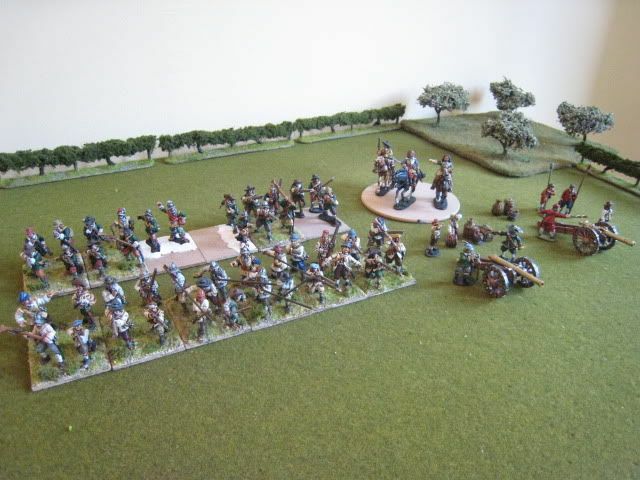 The figures are the usual mix of Renegade and Bicorne, mainly the latter. There is the prospect of a game at some stage in August and so I'm trying to squeeze in as much ECW stuff as I can at the moment. 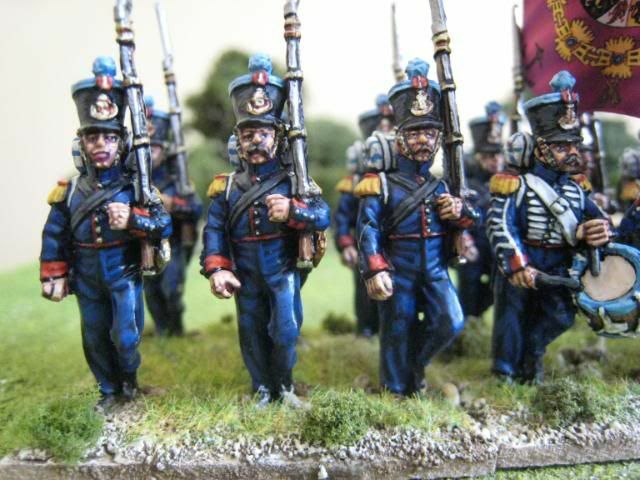 Hopefully at the weekend I will finish off my two command stands and come to a decision about basing the artillery (painted but unbased now since early June). 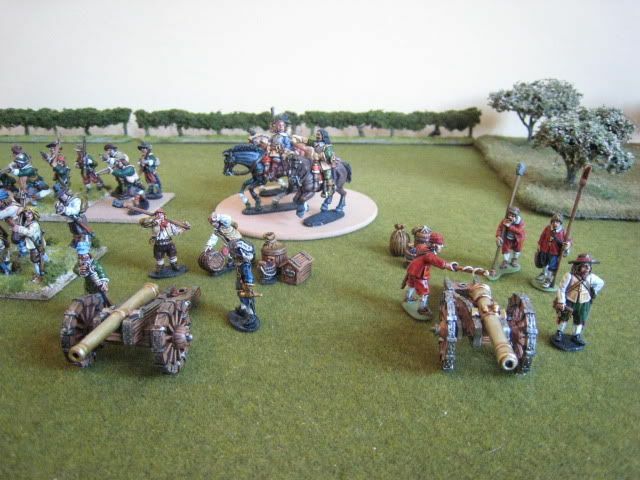 I'm also hard at work on Prince Rupert's regiment of foot, and I need to get cracking on some horse too. 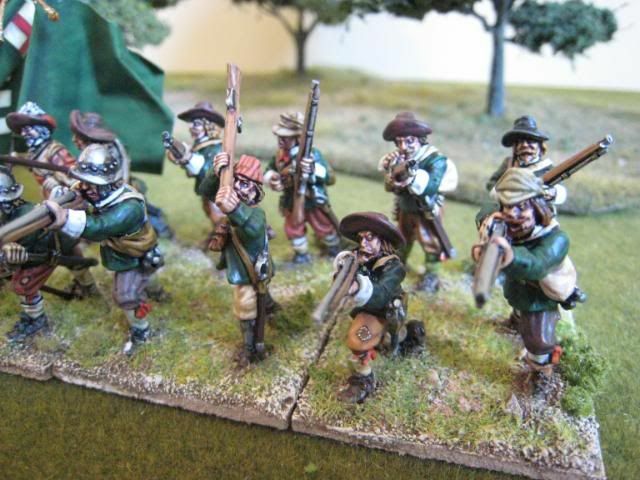 I'll post some more Carlist War figures at the weekend and will also try to do a report of the recent big game with the Perries. 24 figures. Painted June/July 2009. Flags by GMB. 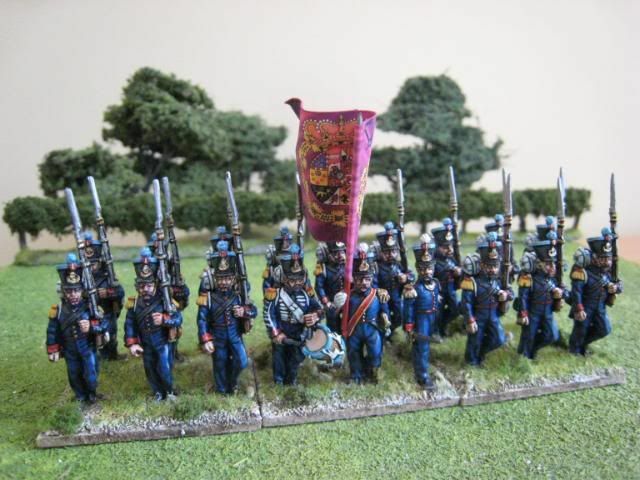 In addition to "regular" infantry battalions, the BAL included a corps of riflemen. The man charged with raising this unit was Edward Costello, a sergeant in the Peninsular War who had been given the rank of lieutenant in the BAL's 7th regiment. Costello's recruiting was successful, and within 8 weeks he had 500 men. The corps fought in all the major engagements in which the BAL found itself. 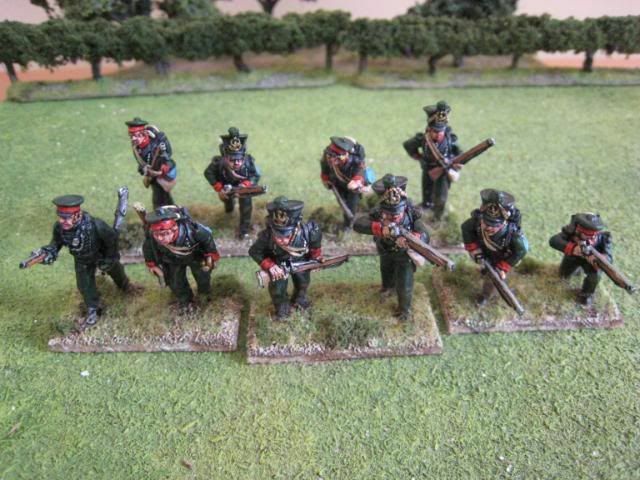 As with other infantry units, the riflement were dressed and equiped as per their regular army counterparts - rifle green coatees with red facings and black equipment. 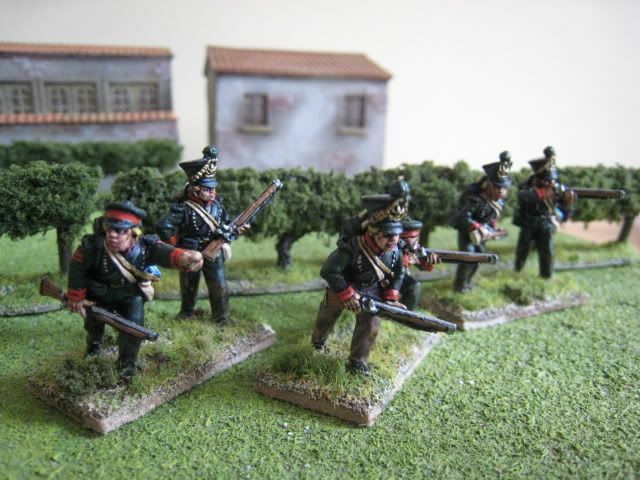 These figures are based on Napoleonic-sized skirmisher stands, measuring 40mm x 20mm. I'm afraid I don't know enough about Napoleonic uniforms to know whether the figures in forage caps would be suitable for that period. These are nice figures, though - full of animation and character. 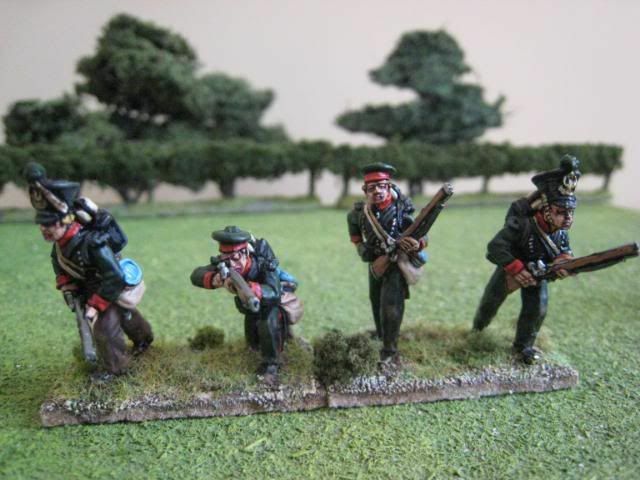 The paints used for the coatees were Foundry's "Russian Green" 69B and C (the A shade is almost black and so unusable) highlighted with "French Chasseur a Cheval Green" 71B and C. As they are skirmishers, I gave the figures a bit of a mud dusting on their knees and trouser bottoms. 10 figures. Painted May/June 2009. 6 figures. Painted July 2009. I apologise for the lack of decents posts recently - work has taken over again. 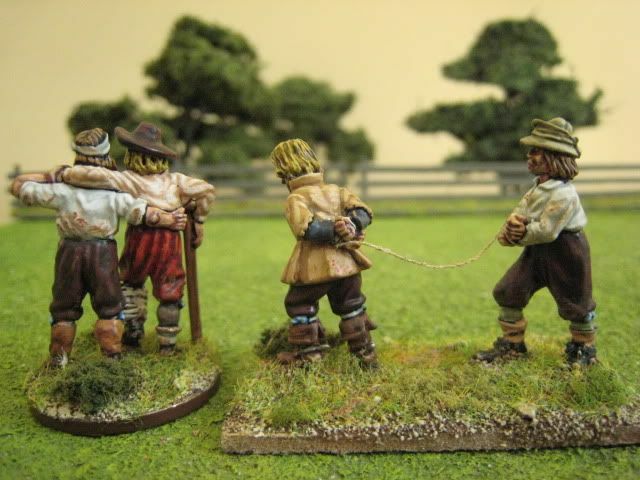 I have yet to post pictures and a report of the large game I had with the Perries a couple of weeks ago. The reason is that I want to post some more FCW troops first, which should help identify the various figures in the game. To set the game itself in context, I'll use this post to sketch the Royal Expedition of May 1837, which provided the basis for the scenario we played. Carlist strength was particularly strong in the northern provinces. In 1835 the Carlists developed a strategy of launching columns from their Basque heartlands into the Spanish interior in an attempt to rally supporters to Don Carlos' cause and find new recruits. These columns were very mobile but relatively small. They could tie up Isabelino forces and fight small-scale actions, but lacked the numbers to engage their enemies in strength. Nonetheless, these "expeditions" were successful in bringing the war into the southern areas of Spain and drawing pressure away from the other Carlist armies in the north and east. One of the last, and certainly the most dramatic, Carlist expedition was the "Royal Expedition" of 1837. The Royal Expedition seems to have been prompted by an overture by the Queen Regent that an end to the conflict could be brought about by a marriage of Queen Isabel to Don Carlos' eldest son. 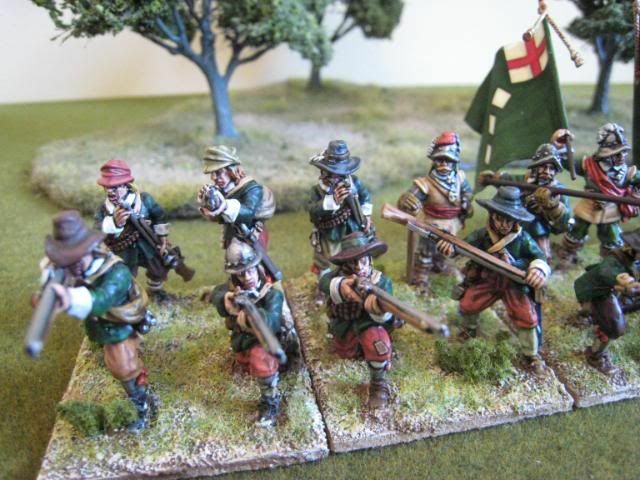 Carlist fortunes were riding high at this time, as an Isabelino force and the British Legion had suffered a bad defeat at Oriamendi in March. 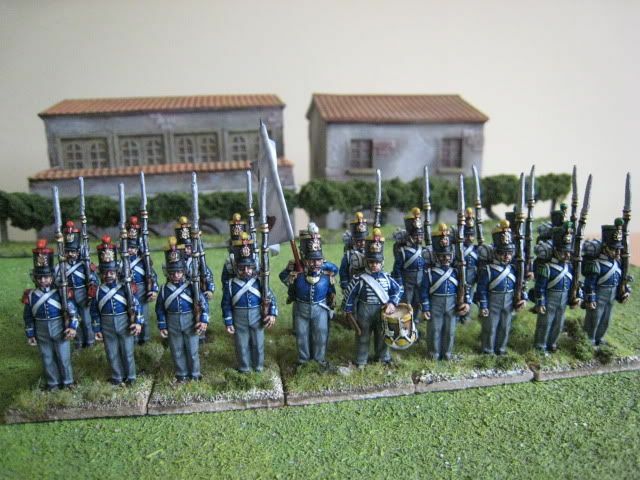 Don Carlos began a march from the north down to Madrid to meet the Regent and discuss this proposal, taking with him an army of some 12,000 men under the command of his 26-year old step-nephew Don Sebastian. 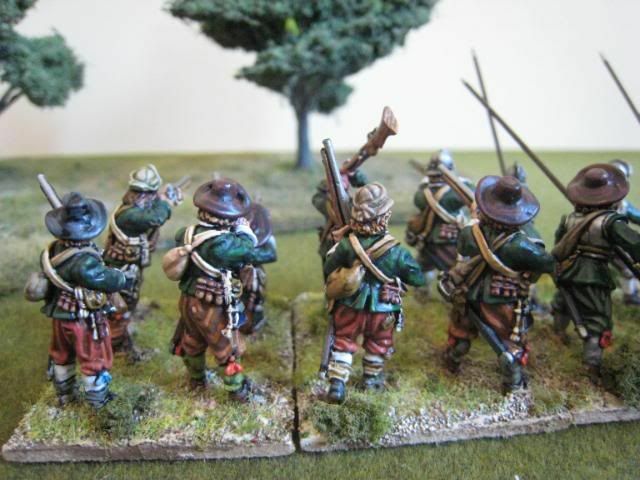 The expedition reach Madrid in September, after engaging Isabelino forces at several points on the way. However, by the time Don Carlos arrived for his audience with the Regent, the Isabelinos had changed their minds about coming to terms and Don Carlos was refused entry. 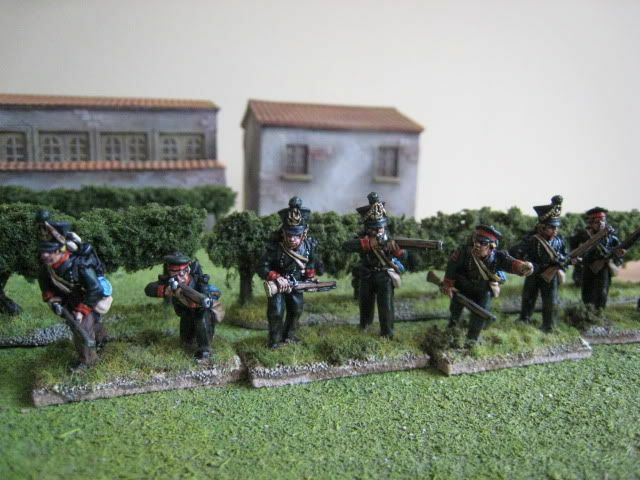 Wary of being intercepted by the main Isabelino armies, which had been ordered to hurry to Madrid's aid, the Carlists did not attempt to take the city but turned around and moved through the Castile region to link up with reinforcements. 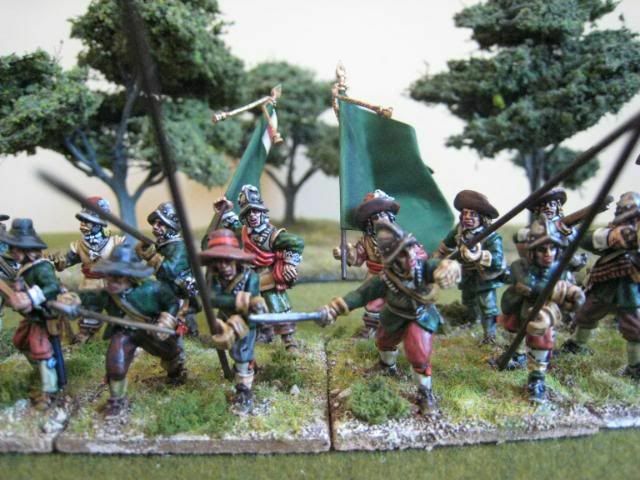 The Carlists were pursued by Isabelino forces under General Espartero. The Carlists were finally halted at the battle of Aranzueque, which prodiuced a notable Isabelino victory and forced the Carlists into full retreat. What had begun as a victory march on Spain's capital had ended as an embarrassing defeat. 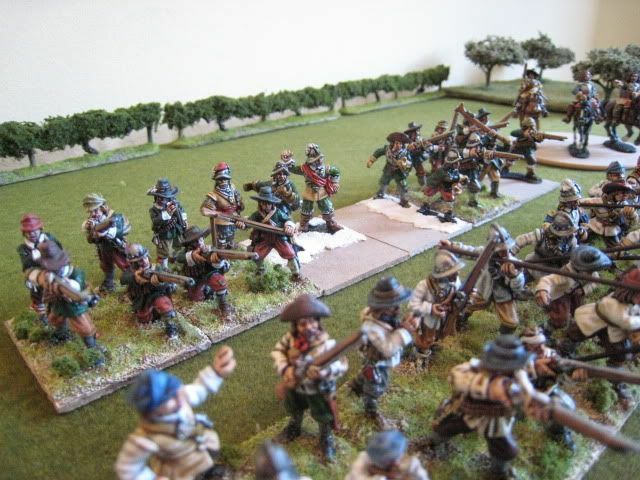 Our game was set in the latter stages of the expedition, with Don Carlos fleeing the pursuing liberal forces and trying to save himself and his army from capture. I'll post a couple more units over the next few days to clear the backlog (I'm still only posting pics of stuff I painted in May!) and then hopefully will have a report of the game some stage early next week. Lots more ECW coming up too. 20 figures. Painted May 2009. Flag by Adolfo Ramos (via North Star).